Saturday marked the opening of Smorgasburg, the 100 vendor market that annually introduces NYC to it’s newest novelty food obsession. This year it isn’t Ramen Burgers… but it’s not far from that. It’s that time of year when our instagram feed gets overrun by weird novelty food. Yeah, Smorgasburg is back! It seem’s like this year Spaghetti donuts have entered the NYC zeitgeist in a big way, but before we get to those, here are a few other delicacies that are worth your attention. You don’t need a campfire to enjoy these smores. Sure, they may not be the most photogenic offering at the market, but we’ll be damned if they aren’t delicious. Buy it for the instagram shot, buy another to feed the addiction. 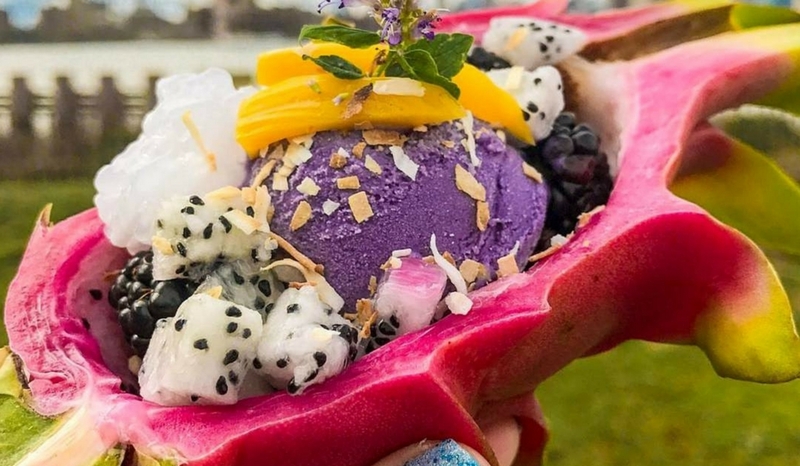 This Filipino dessert is not only beautiful but absolutely delicious. Home-made ube ice cream, diced dragon fruit, and toasted coconut flakes. You’ll be transported to an island paradise after the first bite.
? @feedyourgirlfriend The best part of today was meeting the Filipinos excited for the classic #halohalo, the #williamsburg man who came back to order our #ube drink FOUR times, the vegan/plant-based fans eyes-wide-open to food options they can have,@feedyourgirlfriend for taking our favorite shot of the day that reflects the numberous boyfriends that actually DID buy a bowl for their girlfriend and considered our #vegan #musubi bbq for themselves, and the numerous people asking “what is ube?” and willing to try a taste of something new. We can’t thank enough people that helped us race to prep such as @brooklynfoodworks for giving us an opportunity to use their amazing shared kitchen spaces among culinary gurus, other vendors like @malai_icecream that have been so kind and helpful, our driver Sal and @hafumami for being a stellar sous chef in the wind and cold, and @farm.one for inviting us to get us last-minute edible flowers to celebrate our opening day for any classic halo halo bowl, and most importantly @smorgasburg for believing in us and offering us a space. A day to never forget. “Cheesy”, the sixth main food group. If delicious That melty-gooey-sticky cheese scraped into a fresh toasted baguette doesn’t sound like heaven to you, then the system has failed. there I said it. Not only are these juices delicious, they are one of the most instagrammable drinks at Smorgasburg this year. Fresh juices served in the fruit it’s made out of. What more is there to say, delicious churros and ice cream, this one is kind of a no-brainer. Cookie shaped churros filled with a scoop of ice cream. Yes, please. With flavors like red sauce, aglio and olio and carbonara, Pop Pasta’s Frankenstein’s monster has blown up this year. If you haven’t tried these yet, you will. Even if it’s just to be part of the conversation.